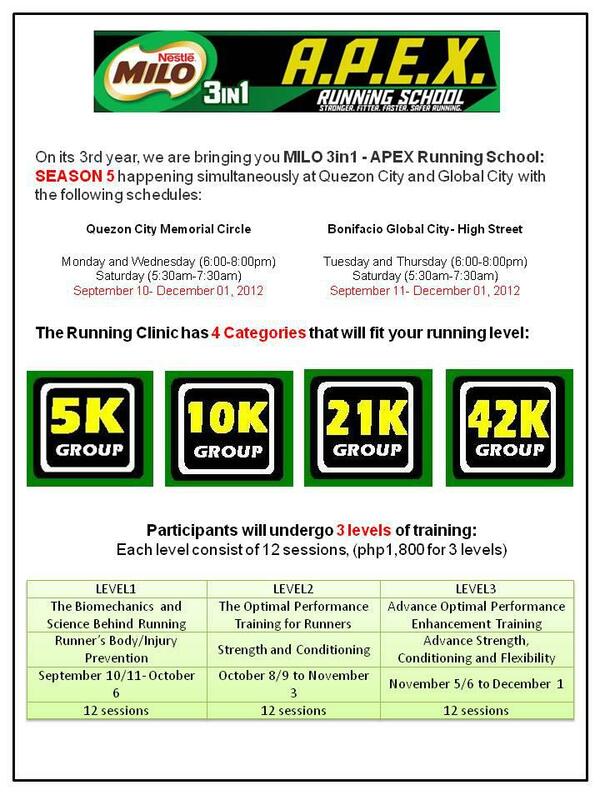 Great News to all runners from South and Manila-Pasay Area,. The Biggest Running Camp in the Country has its new training location. 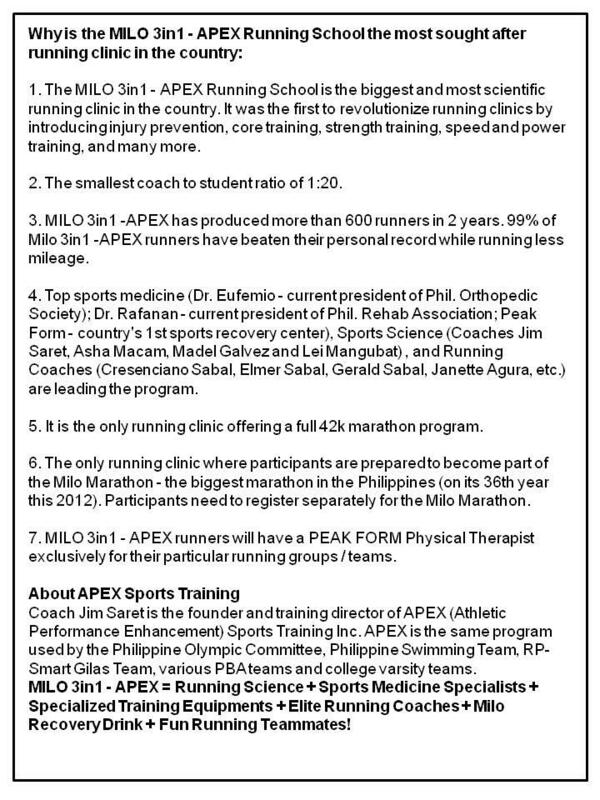 This will be located at SM Mall of Asia, Starting October 1- December 2012, Milo 3in1 Apex Running School will bring the passion at the place nearby. Join us and get train with our Elite Coaches at Quezon City Circle, Bonifacio Global City and SM Mall of Asia. 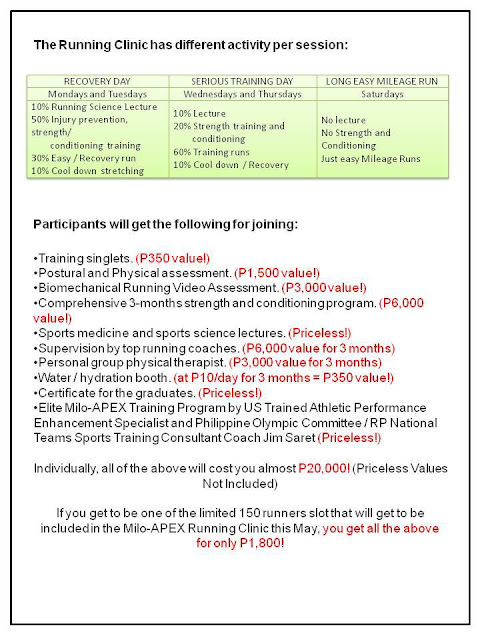 All enrolled participants can attend in any of the following locations. 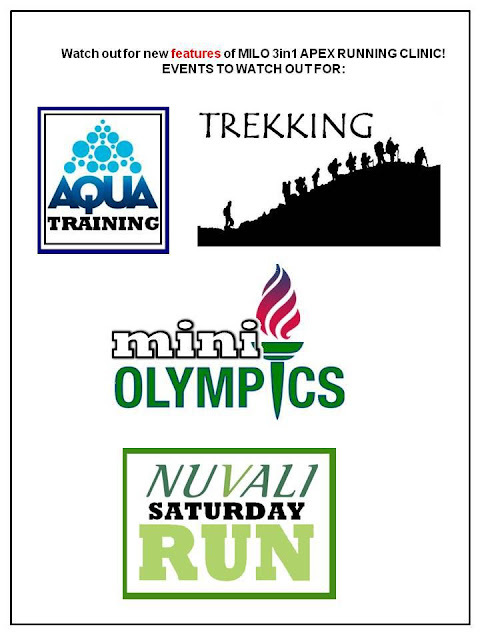 These are the activities or events to watch out for! 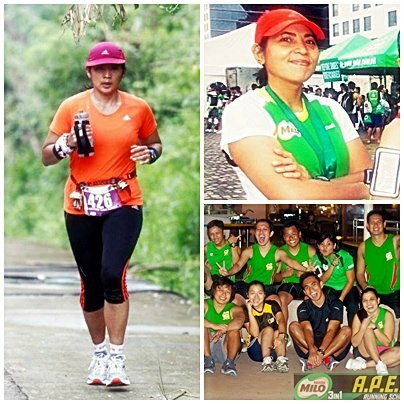 Milo 3in1 Apex Running School Creates this extra events for the group bonding and creates camaraderie of the whole Milo Apex Team from Quezon City Circle and Bonifacio Global City. 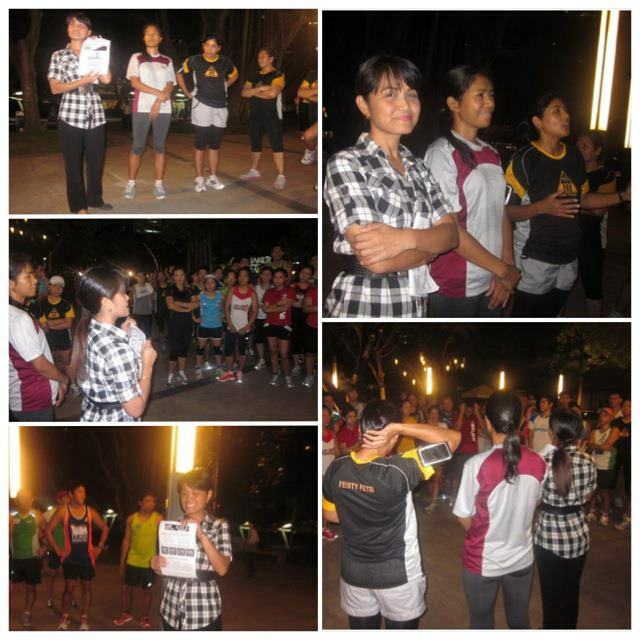 We are not just teaching running techniques but also we are creating a group bond for the whole participants.
" I promise to motivate, inspire, and propel you to achieve your goals; I promise to go beyond your expectations in running;I promise to create an environment and activities where friendship, unity and camaraderie flourish"
"I Promise that once you become a Milo- APEX student, you will not just be fitter and stronger but you will also learn to appreciate different things/sports. I will offer the experience of conquering different heights and lengths of different mountain summits; help you to have full of confidence; new knowledge and experience. Hurry and join me this SEASON 5, KUNG KINAYA KO, KAYA MO RIN!" 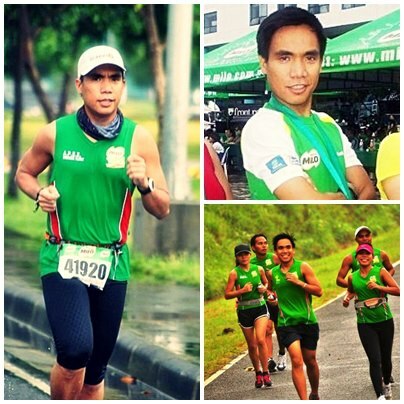 " I promise to build friendship and camaraderie within the team because no one will feel left out in couch. 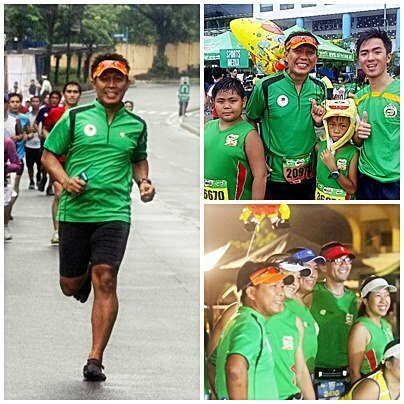 We will struggle equally, not by coming in ahead of co-runners, but by beating oneself. Together, we will make it happen. KAYA MO YAN!" ore. We want you to look forward to each run, not dread it. We will work with you to keep your running light, fun, productive, and variable to to avoid stale running and plateaus. 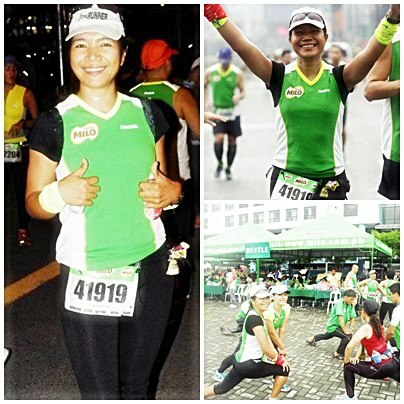 Running is seriously fun! 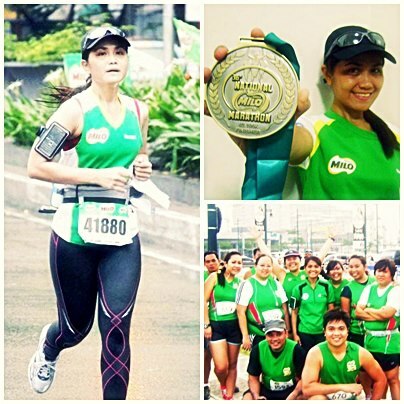 Looking forward to your journey in Milo APEX Running School. KAYA MO YAN!" 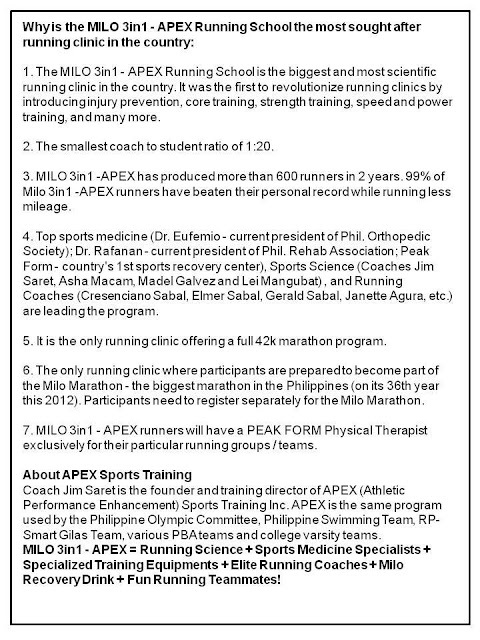 " I PROMISE TO FIRE UP YOUR SPIRIT, TO HELP YOU RUN BEYOND YOUR LIMIT, EXPLORE YOUR BOUNDARIES, TRY NEW CHALLENGES AND BE WITH A FAMILY OF RUNNERS- MILO APEX." From Left to Right Lower Level: TM's Jackie Gutiterrez; Peachy Tamayo; Apex Admin Grace Siongco; Coach Jim Saret; Coach Tonette Dimaguila; Apex Admin Monica Ann Loares; Coaches Adonis Lobaton and Ariel. So Hurry and Join us this Season 5 at Milo 3-in-1 Apex Running School. You can choose what place you are closer and join in any of the places mentioned above if you miss the training session on the place where you are enrolled. See you all!